This component connects to a Elasticsearch server to retrieve data and load it into a table. This stages the data, so the table is reloaded each time. You may then use transformations to enrich and manage the data in permanent tables. The component offers both a Basic and Advanced mode (see below) for generating the Elasticsearch query. Basic/Advanced Mode Choice Basic - This mode will build a Elasticsearch Query for you using settings from Data Source, Data Selection and Data Source Filter parameters. In most cases, this will be sufficient. Advanced - This mode will require you to write an SQL-like query which is translated into one or more Elasticsearch queries. Authentication Method Select Choose a method to authenticate your connection to the Elasticsearch server. Component properties will change to reflect this choice. Available choices are User/Password, PKI and None. Note: When using 'None', for an instance on an AWS Elasticsearch server, the Matillion ETL instance should be on the same VPC. Server Text The server IP or DNS address of the Elasticsearch server endpoint. Port Text Use to provide a port number. The default port for Elasticsearch listening for HTTP traffic is 9200. SSLClientCertSubject Text The email address of this client. Must be in the format 'EMAILADDRESS=<youremail@address.com>'. e.g. Password Text A valid password for the Username above. (Available when Authentication Method is 'User/Password') Users have the option to store their password inside the component but we highly recommend using the Password Manager option. Data Source Choice The name of a Elasticsearch collection. Collections are analogous to Tables in other databases. Limit Number Provides an upper limit on the number of rows retrieved from the Elasticsearch server. Blank means fetch all records. Value A value for the given Parameter. The parameters and allowed values for the Elasticsearch provider are explained here. Connect to the Elasticsearch Server and issue the one or more queries. Stream the results into objects into a storage area, recreate or truncate the target table as necessary and then use a COPY command to load the stored objects into the table. Finally, clean up the temporary stored objects. In this example we want to load user data from an Elasticsearch server. The Orchestration job to load the data is shown below. Our Orchestration job uses the Elasticsearch Query to load in data from the Elasticsearch server. 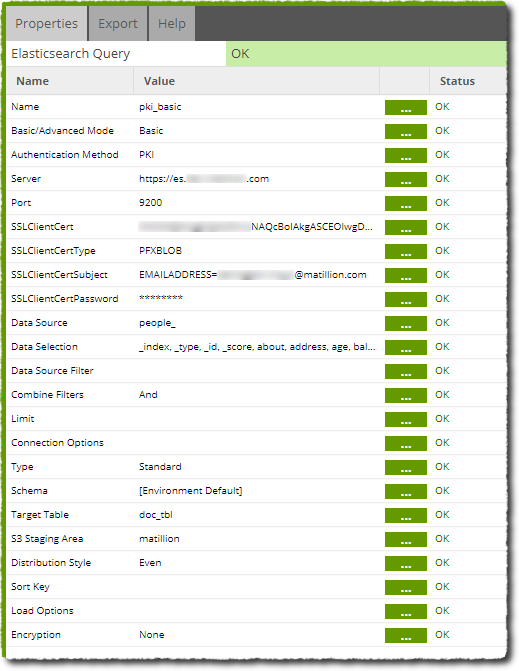 We have authenticated our connection to the server using PKI with details entered into the 'SSLClient' properties on the component. When run, this component loads the data into the target table 'doc_tbl' which can be sampled using a Table Input component in a Transformation job. The sample is shown below. However, we now decide we want to refine this data to include only active users. We could have done this using the 'Data Filter' property on the Elasticsearch Query component before the load. Since the load is already completed, we decide instead to use a Filter component in a Transformation job, shown below. The filter is set up to include only examples where values in the 'isactive' column are 'true'. Since our Transformation job includes the Table Update component, this data will be written to doc_tbl, overwriting our earlier data. Now we can sample the data once more to show our final, refined data. Notice that in the filtered data, we now only have rows where 'isactive' is 'true'.